Laszlo Birinyi will be a featured speaker and presenter at two up and coming events. Mr. Birinyi gives very few public presentations (his last was over a year ago in Stamford, CT), and will likely give even fewer in the future. Sponsored by the Quinnipiac University School of Business, Laszlo Birinyi will give the keynote speech from 9:15 to 10:15am. Click here for more information and registration information. Laszlo Birinyi will be a presenter at the AAII Conference held in Orlando, FL between November 8th and November 10th. Mr. Birinyi will speak on Friday, November 9th, from 3:45 - 5:00pm. The topic, entitled "The Market Is Changing -- Are You?," will discuss his views on the impact of computerized trading and the removal of the "human element" from the system, as well as developing financial tools and shifts in market activity and forces. Mr. Birinyi has been a prominent member of the financial community since the mid-1980s, albeit one of the more discreet members. For a full biography and more information on his firm, Birinyi Associates, click here. Our apologies for not listing this post yesterday, as many of you know earnings season is a busy and exciting time in the research industry. As some of our readers may have noticed, the weekend edition of the Wall Street Journal ran a small and under-emphasized (we think) article saying that the New York Stock Exchange has filed to end its trading collars. These collars were put into effect after the '87 crash, and are activated by 2% moves in the NYSE Composite Index. Their purpose is to control the impact of computerized trading programs that invest across the index. In a move that is meant to help NYSE listed stocks compete more with other less restricted exchanges, the New York Stock Exchange might be removing some of its prestige and security. The trading floor is all but dead, and without collars to calm uncertain markets, risk increases. As Birinyi Associates has pointed out in numerous reports and articles this year, computers are now operating on both sides of many trades. 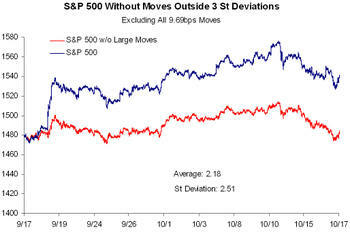 As highlighted in topical study #36, The Next Crash, many erroneous trades are now busted (or forgiven and taken away), but the trades occur nonetheless. If the trading collars are removed, the only broad market controls left are the circuit breakers. They are triggered by 10%, 20%, and 30% declines in the Dow Jones Industrial Average. 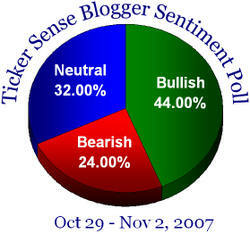 A primary concern is that the Dow comprises only 2% of all stocks listed on the NYSE. An equally disturbing concern is the seemingly forgotten Dow move on February 27th, of this year. 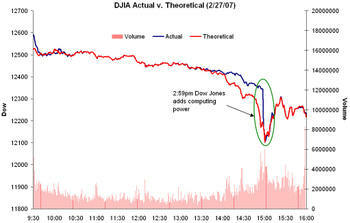 February 27th was the day that trading overloaded the computer system used to calculate average, and stocks were actually trading significantly lower than indicated by the Dow (chart below). A third concern is that currently a 10% move in the Dow is 1,387 points. If an investor owned 100 shares of each Dow stock, a $169,847 portfolio as of 10/26, and they all declined by 10% (thus also causing a 10% decline in the DJIA) that person would lose $17,094. These figures are only as of the first circuit breaker. The bulls continue to stay bullish. The Birinyi Reminiscences Newsletter will be published after the market closes on Wednesday, October 31st. The newsletter, published on the last Wednesday of every month, consists of Laszlo Birinyi's personal market commentary and insight, long-term views to help build a stronger investment strategy, as well as the three newsletter portfolios (updated and changed as necessary every month). Performance for the portfolios is shown below. Be sure to sign up before Wednesday afternoon to ensure prompt delivery of your newsletter. Click one of the buttons on the left side of this screen, $22.99/month or $225/year. 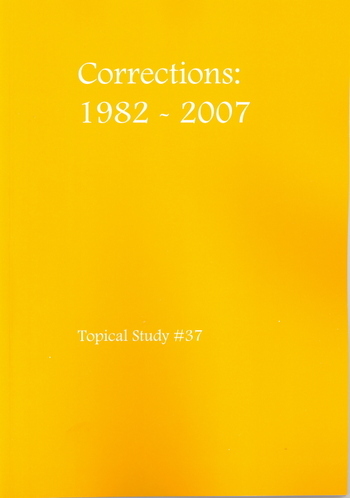 Birinyi Associates Topical Study #37, Corrections: 1982-2007, was recently published and distributed to our Mini-Institutional clients. 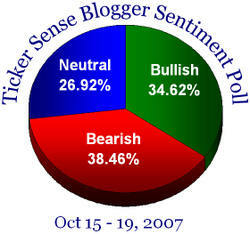 Corrections is an in-depth study into all 10% to 20% market corrections since 1982, and corrections in excess of 5% since the advent of the 2002 bull market. Areas of interest include: sector performance before, during and after each correction; the worst day, when those days often occur, and their impact on the correction as a whole; and fundamental, technical, economic and sentiment factors surrounding each correction. 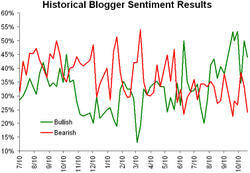 Each correction is also highlighted with day-by-day analysis of the period, in addition to Mr. Birinyi's personal take on the driving factors of each correction (developed by reviewing newspaper and magazine articles from the time). Birinyi Topical studies are only available to Mini-Institutional subscribers. Follow the link to learn more. 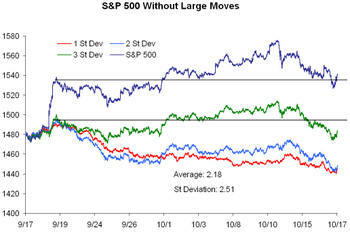 The bulls have rallied after Friday's weak performance. 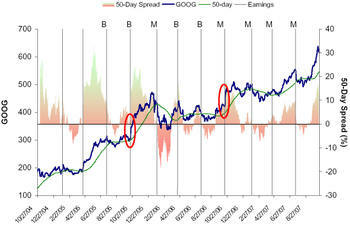 With Google reporting earnings after the close, we show below the stock's prior earnings reports. Although excitement usually surrounds the report, we found that since analysts have begun coverage on the stock it has only traded up as a result of earnings twice. More importantly, at it's current level of 639.85 the stock is 16.5% above its 50-day price average, the most overbought it has ever been going into a report. Crude's recent rally since 10/8 has pushed the commodity to a new high, but more notably the change was so rapid that it is now 6.5% overbought (at its peak today it was more than 7% overbought). 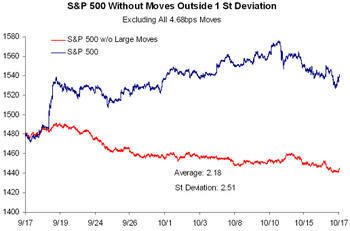 (Or 6.5% above the upper boundary of its trading envelope.) 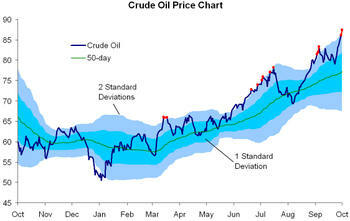 In fact, at its current level of $87.40 per barrel, crude is two standard deviations above its 50-day moving average. We looked back at similar spikes this year, where crude was two standard deviations above its moving average and also at least 5% overbought. In 66% of the cases (highlighted in red on the chart) crude traded down over the following week for an average decline of 1.79%. 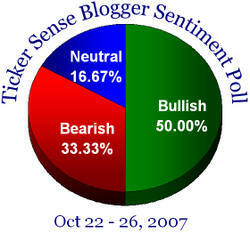 This week's poll takes a swing to the bearish side.